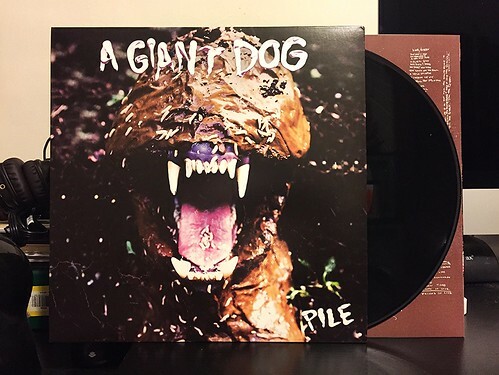 Pile is the third album from A Giant Dog and the second one that I have purchased. I think I should probably go back and pick up their first album as well because this makes two stellar albums in a row for the band. Much like their last record Bone, Pile is a tour de force of powerful guitars, dark harmonies and spectacular hooks. The vocals are mainly held down by Sabrina Ellis, with big time help in the backing and harmonies department by guitarist Andrew Cashen. These two create a whirlwind of powerful howling into the night. With tales of death, drugs and rock and roll, reading the lyrics alone you'd sometimes question what they heck you were actually listening to. But this band has a way of disguising their dark themes within one of the most energetic and flat out rocking bands on the planet. Sure, they might be able to "watch you die and not feel a thing," but you're not going to be all that upset since they've shared this information in the context of one of the best songs of the year, "Creep." The album is consistently rocking from start to finish. Sure, there are some minor variations. Some songs drift into poppier territory while others have more of a glam hint to them. There's a few garagey stompers and even a tender acoustic moment, but the entire time you just get the feeling that you are in the presence of a mighty powerful rock and roll tornado, bearing down on you at breakneck speed. A Giant Dog really stand alone in today's world. I can't think of too many bands that sound much like them, but they are essential listening for anyone that wants to have the doors blown off by a fierce rock and roll band.